There are few New York businesses that command as much of my loyalty as 718 Cyclery, a friendly, specialist bike shop near where I live in Brooklyn. But there’s no question that I’ve handed them a fair amount of my money lately. A quick check through past bank statements suggests that in less than four months since last October 30 I’ve given this deserving business around $270 in spending on my own bicycle, plus another $14 or so on the Invisible Visible Girl’s machine. That’s leaving aside another $30 or so on bicycle maintenance at other bike shops and the $33 I shelled out yesterday for a replacement clip-on light for one that had gone missing. It’s cost me, in other words, around $80 a month over the last four months to keep my bike on the road. Some of that spending was certainly making up for a near-absence of spending in the few months before October. But add in the cost of the extra food I guzzle to fuel my nine-miles-there-nine-miles-back commute and the cost of the higher wear and tear on my clothes and it’s not clear I’m doing myself a financial favour by using transport that I don’t pay for daily. 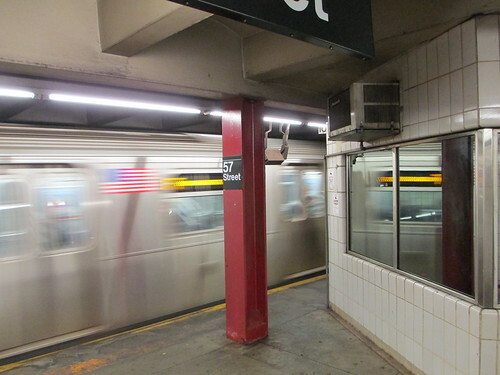 At the current basic New York subway fare of $2.25 for a single ride, four weeks’ commuting would cost me $90 – and there are numerous ways of getting the rides cheaper than that. Even a looming – and highly controversial – hike in the basic fare to $2.50 may not put me in the black. But it’s not the bike shop’s fault I’m getting a relatively raw deal. It’s noticeably cheaper to keep my bike maintained in New York than it was when I lived in London. 718 Cyclery has been more than generous in carrying out free adjustments and calculating its labour charges. I’m at a disadvantage because pretty much every other means of getting about New York City gets a significant explicit or implicit subsidy of some kind. It’s not a purely New York City problem. Virtually no developed country charges drivers enough in fuel taxes, tolls or car ownership fees to cover the costs that congestion, crashes and pollution impose on everyone else. Nearly every big international city tries to encourage commuters to shift to other transport means by susbidising public transport. New York is nevertheless an extreme example. According to the Tax Foundation, a think-tank, taxes, tolls and other charges on motorists in New York State cover only 43.8 per cent of spending on the state’s roads. The proportion of the New York subway’s running costs covered by fares is still lower – and the system is visibly crumbling through lack of maintenance and upgrade expenditure. One might think that, along with reducing the appalling death toll on the city’s streets, a comprehensive rethink of charging for and funding of the city’s transport network would be the top subject for debate ahead of this year’s mayoral elections. Yet there have been only two big transport talking points so far among the likely candidates to succeed Michael Bloomberg as mayor. One is whether the city should hand over a few more slivers of its vast road network to cyclists or, indeed, start taking out the bike lanes already in place. The other has been whether the city should turn its back permanently on congestion charging – the one policy that any city has shown can tackle problems like New York’s. Those problems, meanwhile, are immediate and practical. While the £10 ($16) congestion charge used to funnel through traffic away from my cycle route to work in central London, New York’s current financing arrangements actually push such traffic towards me. Every morning in TriBeCa, one of the most densely-packed areas of lower Manhattan, I see swarms of New Jersey-registered cars heading from the Brooklyn Bridge towards the Holland Tunnel going to New Jersey. Many seem to be avoiding the $13 toll charged westbound on the Verrazano Narrows Bridge further down New York Habour linking Brooklyn, Staten Island and ultimately New Jersey. Further uptown, the streets east of Central Park swarm with the traffic that pours from Queens across the free Queensboro Bridge to avoid the tolled alternative routes. Yet it’s hard to imagine persuading men like the motorist I encountered on Vanderbilt Avenue in Brooklyn the other day that higher fuel taxes are the answer. Clambering out of his car with a weary look, he cast a wary glance over my bike and said, “Well, you’re certainly saving money on gas, buddy.” Precisely because US motorists pay far lower taxes on fuel than road-users elsewhere, they’ve seen far bigger percentage hikes in costs from recent years’ high oil prices. It’s impossible to imagine any politician persuading a US electorate in the foreseeable future of the case for increased fuel taxes. Nor is it easy to imagine any politician raising subway fares to a level close to covering the system’s high costs. Visiting the New York Transit Museum last Tuesday, I read the grim story of how politicians have always struggled to raise fares on the system, first from a nickel to a dime and then gradually upwards. The problem is further exacerbated by the system’s inability to charge different fares for different distances. Most people would surely agree that $2.25 is a bargain to ride from Coney Island to the outer reaches of the Bronx. But start talking about raising fares and people picture themselves paying $3 to ride from Penn Station to 59th street, a different prospect altogether. 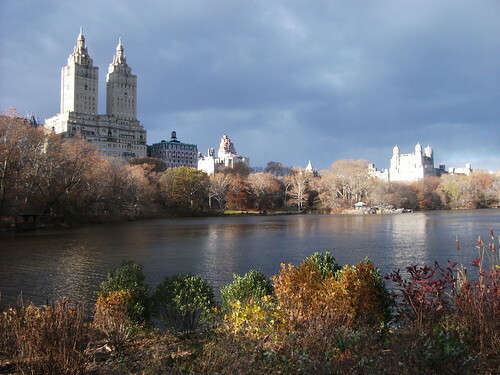 The only feasible answer, it’s clear, is for the successful mayoral candidate to resurrect plans to charge cars to enter the area where they are least needed and do most damage – Manhattan south of Central Park. The area is well defined, excellently served by public transport and currently blighted by vast quantities of traffic, much of which could go elsewhere. A reasonable charge would not only raise badly-needed revenue but also make a subway fare hike far more politically feasible. Those two manoeuvres together could unclog Manhattan’s streets, increase the incentives for drivers to switch to other modes and actually make it financially advantageous for commuters to switch to walking and cycling – the only modes doing virtually no damage to the city's environment or infrastructure. There’s no mystery about such a policy’s effectiveness. Congestion charging has reduced sharply and continuously the number of cars entering central London since its introduction 10 years ago. New York could surely come up with a more cost-effective charging system than the British capital. Yet Christine Quinn, the city council speaker and the person many people expect to be elected mayor later this year, earlier this month said she didn’t anticipate congestion pricing’s “coming back around” after an effort she spearheaded to introduce the policy in 2007. That effort died after state-level politicians in Albany vetoed it. She has subsequently recanted slightly, saying she still supports the policy but doubts it can be successfully introduced. That leaves New York City in a far worse state transport-wise than London before its congestion charge’s introduction. The Metropolitan Transportation Authority spends much of its income servicing its growing burden of debt, rather than improving the subway. New York City’s roads are crumbling under the weight of cars that pay far too little to make the damage good. The incentives for other mugs to join me on a less damaging transport mode remain negligible. Future generations will look back with amazement at such predicaments in New York and elsewhere, shaking their heads and wondering why no-one had the courage to take the obvious policy steps. Some kind of charge for road use in Manhattan and many other big centres will inevitably come along. The spread of electric or partially electric vehicles – which pay no fuel tax – ensures it. In London’s story we already know it was the unlikely figure of Ken Livingstone – left-wing firebrand and scourge of Margaret Thatcher – who finally had the courage to bring in such a policy. For New York, it remains a mystery which visionary mayor will have his or her picture in the museums as the transport system’s saviour. The tragedy for New York is that the identity of its transport system's saviour looks set to remain a mystery for many more years - through the whole administration of Christine Quinn or whichever other uninspiring choice next sits in City Hall. It was a brief taste of how most of suburban America and Europe lives and it wasn’t, frankly, terribly pleasant. 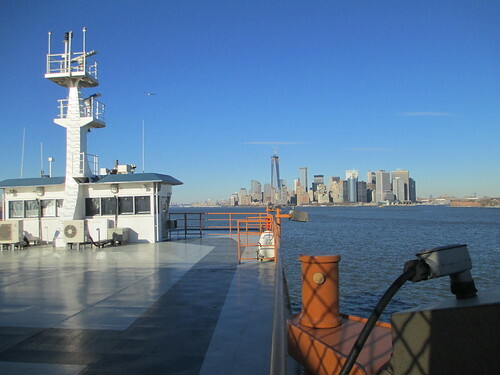 This past Wednesday, for work reasons, I took my bike and, for only the second time in my life, travelled by ferry to Staten Island, an island off the New Jersey shore that historical accident has made part of New York City. 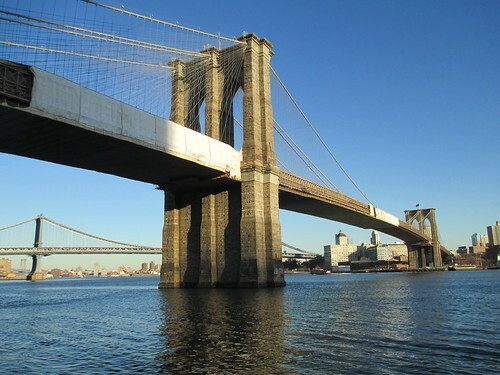 Having mostly developed only in the 1960s after the opening of the Verrazano Narrows road bridge to Brooklyn, it was designed around the private car far more than other parts of the city. It’s the nearest thing in New York City to a chunk of true American suburbia – featureless apart from occasional strip malls and criss-crossed by wide, fast-moving, multi-lane expressways. I began to have concerns about cycling conditions even before I was properly out of St George, the borough’s capital. A bus driver drove at me, apparently astonished that my being ahead of him in traffic meant I thought I should go first through a pinch point. Later on, I started to wonder if I had put myself in serious danger. Unable to use the seafront cycle path – still blocked with sand from Superstorm Sandy – I headed inland along long, straight six-lane avenues. The 30mph and 35mph speed limits on these roads seemed to be regarded as minimum permissible speeds. Encountering a cyclist, such drivers simply drove straight on, at speed, towards the bike, on the apparent assumption the cyclist would scuttle out of the way. But I probably shouldn’t have found the conditions surprising. While I have multiple complaints about cycling conditions in brownstone Brooklyn and Manhattan – the places where I currently mostly ride – and in London – where I used to ride – these are actually atypically cycle-friendly environments. Many roads are narrow – inhibiting drivers’ tendency to speed – and the traffic’s sheer volume makes the speeds on Staten Island mostly impossible. The obvious attractions in such an environment of the bicycle – which can slip along such streets while cars remain gnarled in traffic jams – have contributed to recent years’ rapid growth in inner-city cycling numbers. Better provision is slowly arriving in the wake of increased cycling. Conditions on Staten Island are far more typical of the places that most rich countries’ inhabitants live. Such places provide most inhabitants with a house on its own plot of land – but suffer from the sheer volume of traffic that sprawling, low-density cities generate. I’ve encountered similar conditions in parts of commuter-belt Oxfordshire, Cheshire and Scotland’s central belt. Cyclists tend not to give much thought to such places for the simple reason that very few cyclists live in them. The natural reaction might be to conclude that cycling is impossible in such places, to avoid visiting them as far as possible and to leave the bicycle behind when circumstance forces one to do so. The only alternative is a wholesale rethink of the car’s role in such societies. It’s often said that cycling children are a kind of “canary-in-the-coalmine” of cycling policy. If you disperse pretty much every danger factor for cyclists in your city, you’ll find primary school children riding to school. Let even a few of them creep back and the kids will disappear. 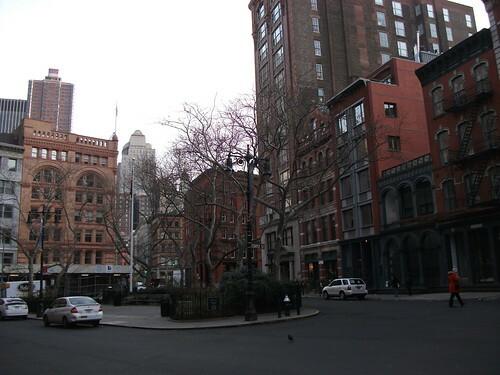 about scenes such as this in Manhattan. By that standard, I’m closer to being the explosion in the coalmine. I regularly cycle along fairly busy, high-traffic roads, including fast-moving dual carriageways in the UK. If the danger factors somewhere have built up to the point somewhere that they’re intimidating me, it’s a reasonable sign cycling conditions are seriously, dangerously hostile. I mostly managed in Staten Island to stick to the principle that a cyclist should boldly take the lane and force motorists to manoeuvre safely around him. But even I at points hugged closer to the kerb than normal, darting out into the threatening traffic mainly to get round obstructions such as parked cars. It felt hard to keep taking the lane on seeing a line of fast-moving SUVs, three abreast, bearing down on one, giving no sign whatever of yielding to a cyclist in front of them. I wasn’t confident I wanted to waste my dying breaths explaining to some over-sized car’s driver precisely why my road craft should have prevented him from running me over. So is there an alternative for cyclists to the appalling conditions that currently exist in Staten Island and many other suburban areas? One standard cycling lobby answer is to argue that entirely separate cyclist provision is needed and that to call for anything less is counter-productive. Cyclists and such heavy, fast-moving traffic can never co-exist. Yet I left Staten Island doubting that calls for a network of dedicated cycle lanes on Staten Island would get very far under current conditions. I saw, as far as I can recall, one other cyclist during an afternoon and early evening on the island. It’s hard to see that a democratic society can risk spending heavily to create facilities for a group – Staten Island utility cyclists – that might not even emerge in the end. That’s all the more the case at the moment, when my cycle route took me past large tracts of shoreline land that remained flooded and empty in the wake of Sandy’s devastation of the island. Even as a dedicated cyclist, I think finite budgets at the moment are best spent on ensuring all Staten Island’s people again have waterproof, heated houses. There are nevertheless compelling reasons beyond encouraging cycling to stop the cancer of car-dependence from draining the life out of Staten Island. The wide, uncalmed roads, it was clear, were intimidating away people other than cyclists. I saw just as few people walking the sidewalks of the busiest roads as I saw people cycling. The excellent “weekly carnage”feature on Streetsblog, the transport website, features regular stories of Staten Island’s elderly and other vulnerable people crushed by motor vehicles refusing to yield at corners. Many of those fast-moving vehicles end up ploughing into each other, at a high human cost. There’s every reason even for someone who’s not a cyclist to support the installations of road designs that slow drivers down and speed cameras. Ideally, the United States would increase fuel taxes to cover more of the costs cars impose on places such as Staten Island. A rational system of per-mile charging could calm down the worst of the congestion. Research suggests that cars might even get where they’re going faster under such a regime than they do at present. A new approach to cars would, of course, produce a better environment for on-road cycling too. It’s far from impossible that in Staten Island calmer, less threatening roads might start to entice out of their hiding places some of the bikes that must be lying unused in the borough’s homes. The island might start participating more fully in the cycling boom that’s taking place, to varying degrees, in New York’s other four boroughs. That, in turn, might make it easy to justify new cycle-only lanes for some future reporter who finds himself heading to a distant corner of Staten Island on an assignment. As it was, finding dark had descended and contemplating the prospect of a 10½ mile ride on threatening roads back to the ferry, I took, unusually, the line of least resistance. Fending off threatening cars, I rode half a mile to the nearest Staten Island Railway Station and, my bike leaning against my seat, took in the island’s night-time lights as most of its inhabitants do – from within the comfort of a metal shell. 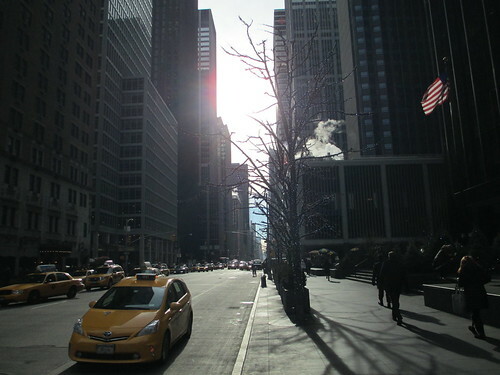 For new residents of New York City like me, there has been something almost mind-bending about the last couple of days. Ever since Ed Koch, the city’s mayor from 1977 to 1989, died in the early hours of Friday, obituaries have been transporting us back to an unrecognisable city. Drug addicts lie prone on Manhattan streets, looting breaks out when the power fails and the subway is celebrated mainly for the range and inventiveness of its graffiti. It’s hardly surprising that the person who pitted himself against this chaos had a personality as pathologically extroverted as our current mayor’s is buttoned-up and controlled. But, for a newcomer who’s a cyclist, one detail of the Ed Koch saga highlights a particularly striking change in the city. 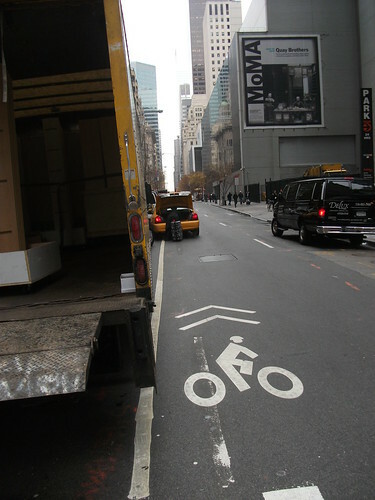 In 1980, at the height of the second oil price shock, Koch ordered the installation of segregated bike lanes on Fifth, Sixth and Seventh Avenues and Broadway in Manhattan. 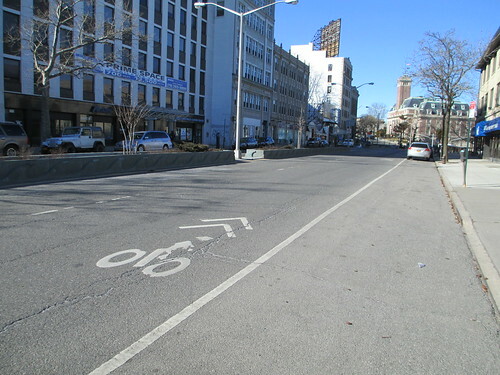 Then, only weeks later, having been ridiculed for his bike lane “fetish,” Koch had the lanes torn out again. He went on, in 1987, to try to ban cycling altogether from mid-town Manhattan. While that set-back took years to overcome, Koch nevertheless died in a city criss-crossed by a growing network of bike lanes. Installation is moving – despite setbacks as Nimbys in some neighbourhoods oppose new lanes - so fast that my 2012 NYC cycling map already feels quite badly out of date. Thinking about that sharp turnaround – a tribute to the commitment of Michael Bloomberg, the current mayor, and Janette Sadik-Khan, his transport commissioner - has linked up in my mind several hopeful signs for cycling over the last couple of months. In both the US and the UK – the countries where I’ve done most cycling – cycling numbers are going up and official acceptance of cycling appears to be growing. The question is whether this is a fundamental, long-term shift or just another short-term bit of faddism like Ed Koch's. The question brings to my mind a mental picture of a copper-and-black Detroit Bicycle Company fixed-wheel bike. As someone who likes both gears and highly practical bikes, it’s not a machine I aspire to own. 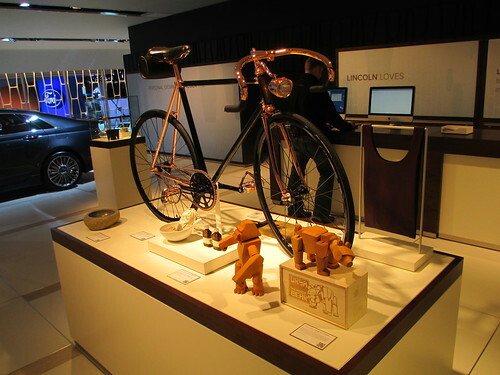 But I came across the bike – a Detroit Madison Street, trivia fans – in the unlikely setting of the Lincoln stand at Detroit’s annual North American International Auto Show. It was being held up as an example of the kind of finely-made luxury product of which Lincoln – which is trying to relaunch itself as a desirable luxury marque – approved. Still more remarkably, it was one of quite a few bikes I spotted around the show floor. The Smart stand boasted an E-Bike, which the manufacturer will be selling, while Toyota displayed a concept for a conventional bike. Kia was showing a small-wheeled bike that it sells in Korea, while Hyundai had a fixed-wheel bike sticking out the back of a coupe. Subaru had stuck a couple of mountain bikes on the roof rack of one of its vehicles. The unmistakeable impression was that carmakers thought bikes now had a certain cachet – which they wanted to borrow. Compare that with how the UK’s Raleigh in the 1960s felt it had to ape motorbike design to get kids to ride bikes. The bikes’ presence on the automakers’ stands struck me all the more forcibly because of an article I’d written in my day job just before Christmas. It detailed how all the Detroit Three big automakers – General Motors, Ford and Chrysler – were struggling to reverse or live with recent years’ steep decline in young people’s learning to drive and subsequent buying of cars. Part of the carmakers’ problem stems from a gradual revival in recent years of the US’s inner cities – which are less littered than they once were with unconscious drug addicts - and, for some of the residents, a drift away from cars and towards bicycles. It’s the kind of gain for cycling that would have been scarcely imaginable in most industrialised countries 25 years ago when Mayor Koch was trying to ban cycling altogether. A YouTube video posted by Gaz, a keen helmet-cam user reminded me that the process has already gone far further in the UK. His video – shot one recent January day – showed 50 cyclists on one short stretch of Cycle Superhighway 7 (a former Roman road, as it happens). If so many people are cycle commuting in January, Gaz suggests, the spring and summer are likely to see London’s highest cycle commuting numbers in many years. The worry, of course, is that cycling also looked so much like the coming thing in 1980 that a gadfly populist such as Ed Koch briefly took the risk of backing it. If car companies thought there was a way other than sticking two bikes on the roofrack to show their car was associated with an outdoor, aspirational lifestyle, I’m sure they’d happily use it. Denis Hamil, a columnist in the New York Daily News last week said he would support any mayoral candidate who promised to scrap the current crop of bike lanes. One of the likeliest contenders for mayor – Christine Quinn, a Democrat – has sought to appease bike lane haters by saying lanes are “controversial” and advising people not to discuss them at dinner parties. In London, even Boris Johnson, the mayor, who is a daily cyclist, fell before the last mayoral election into the trap of caricaturing cyclists as dread-locked red-light jumpers. As with road safety – where the current UK government has reversed years of steady improvements by cutting funding for speed cameras – there is always a risk that someone will take steps that reverse apparently inexorable progress in a positive direction. It doesn’t, for what it’s worth, feel as if such a step is coming immediately either here in New York or in the UK. Concern about the environment, changes in living patterns, concern about health and cycle technology improvements are all conspiring to make this cycling boom feel far more solid and longer-lasting than the second oil shock one. But it’s worth remembering that, even after recent years’ quadrupling of New York cycling numbers and the last decade’s doubling in London, riding a bike remains a fringe pursuit that’s far from winning mainstream acceptance. That point came home to me particularly clearly one Friday night just before Christmas. Riding home around 10pm down W55th street from my office, I was surprised to find a limousine pull up next to me and wind down its window. Inside was a curious tourist who couldn’t understand what I was doing. 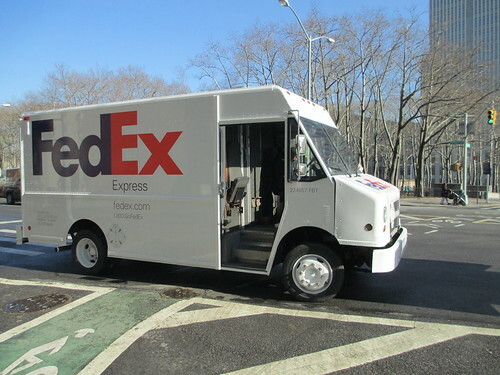 No, I told him, I wasn’t delivering anything. Yes, I was just riding home from my office. The incident set a new mental benchmark for me for cycling in New York and other big cities where it’s still not one of the main modes of travel. 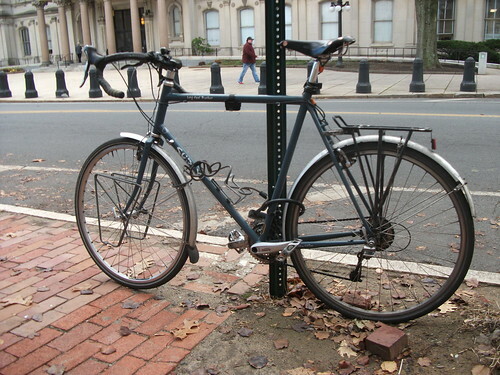 Cycling, I’ve decided, will finally be mainstream when an encounter with a commuter cyclist is no longer one of the “darndest things about New York” that a returning tourist recounts to his friends in Peoria.